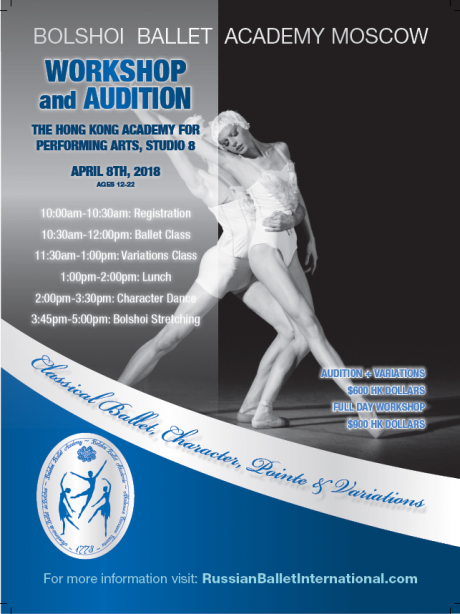 Experience a day of training at the Moscow Bolshoi Ballet Academy here in Hong Kong ! Led by Miss Ekaterina Trunina from Bolshoi Ballet Academy, Bolshoi Ballet Academy Moscow Workshop & Audition includes audition as well as a full day workshop with classical ballet, variation, character and Bolshoi stretching classes for students aged 12-22. Ekaterina Trunina was born and raised in Moscow. She had graduated from Bolshoi Ballet Academy in 1999. She had joined the Bolshoi Ballet Theater where she had become a soloist ballerina and performed with the company until 2008. During her work at the Bolshoi Theater Ekaterina had performed numerous roles in such ballets as The Sleeping Beauty, Coppelia, The Nutcracker, Giselle and Scheherazade. In 2003, Ekaterina had received a Teaching Degree from Bolshoi Ballet Academy Higher Education department and was promoted to a full time professorship at the Bolshoi Academy in 2014. Miss Trunina had traveled extensively to Korea, USA, Italy and Spain as a master teacher for Bolshoi Ballet Academy workshops and master classes.